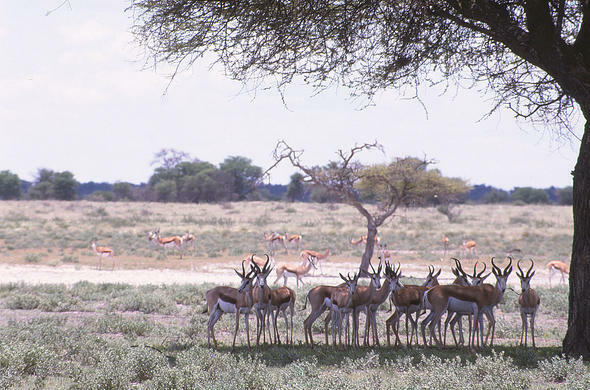 The Gemsbok National Park has been incorporated into the Kgalagadi Transfrontier Park which spans the border between Botswana and South Africa. 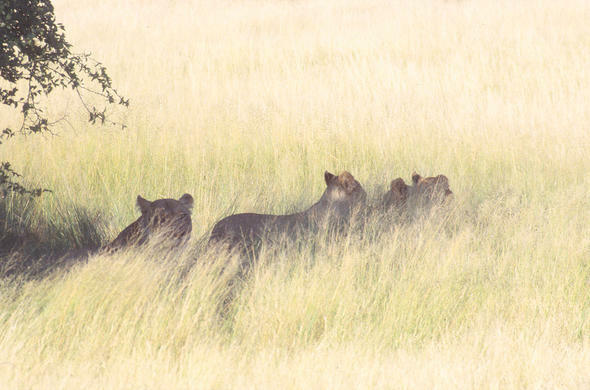 Three quarters of this reserve lies within Botswana and the two governments jointly manage the park. 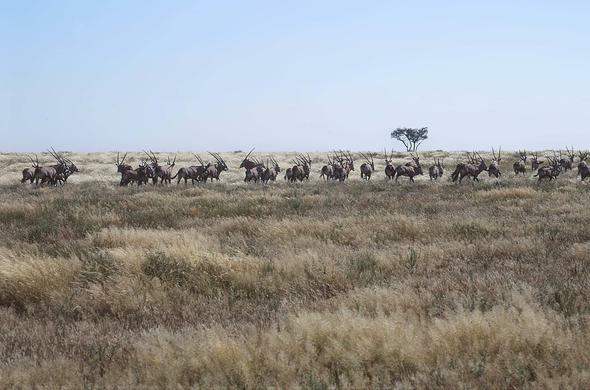 The reserve is home to large herds of Gemsbok (also known as Oryx) as well as Springboks and Gazelles. 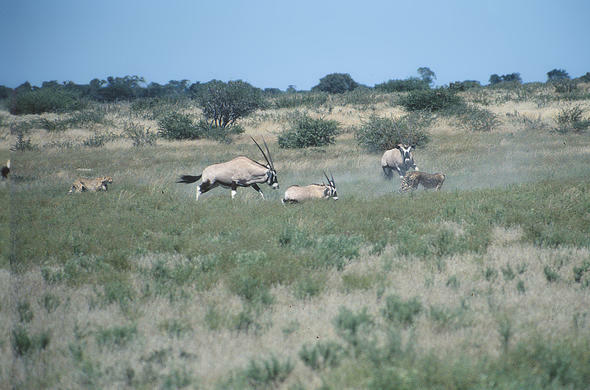 Most of the Gemsbok National Park is covered by large tracts of inhospitable semi-desert. There is no permanent surface water within the park. There are two dry river beds in the park the Auob and Mossob, which have flowed on only three occasions in the last century. When it does rain they experience flash floods that have allowed these rivers to carve their way through the desert. The hottest time of the year is between October and March when the temperature regularly reaches above 40 degrees Celsius. The park has sparse vegetation with dwarf shrubs, grasses and succulents. There are a few species of trees such as the white-barked shepherd trees whose leaves have a high protein content and are a major source of food for the local wildlife. In the dry river valleys there are tall Camel-thorn trees that also provide much welcome shade. Water is provided for the animals from over 80 windmills that draw water from the water-tables.After the brief rains the desert comes to life with a transient display of flowers and bursts of green grass that the wildlife feed on. This respite is all too brief before the harsh struggle to survive continues. Gemsboks are attracted to the mature grasses around the riverbeds and pans. In the dry months they move into the desert in search of food. 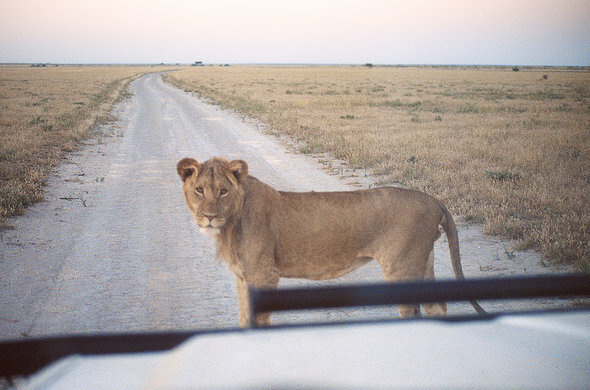 There are also many predators, which include the famed Kalahari Black Maned Lions. These are not a separate species but have developed a striking black manes and seem particularly well adapted to living in the desert environment. Hyenas are commonly seen in the Nossob region. Cheetah and Leopard are common in some areas of the park, and Bat Eared Foxes and Suricate are also common. You will have endless enjoyment watching the antics of these energetic critters. The Gemsbok National Park has no permanent lodges or camps, but there are three campsites at Twee Rivieren, Mata Mata and Nossob. Of these only Twee Rivieren has ablution facilities consisting of cold showers and a toilet. There are no facilities available at the other campsites. The easiest way to get to the Gemsbok National Park is to fly in. There is an airstrip at Tshabong where small chartered flights can land. Then you can hire a 4x4 vehicle and follow the signposts out of Tshabong to the park. There are also landing strips at Twee Rivieren and Nossob campsites. You can hire 4x4 vehicles at these airstrips. The roads are quite rough and you do need a 4x4 vehicle to get around.